There have been numerous examples of citizen action and protests against coal in Australia -- encompassing coal mining, coal power stations and coal exporting -- in recent years. Below are some examples. Rising Tide activists blockade the New South Wales Labor Party on Feb. 27, 2007. The woman in center is attached to the barricade with a bicycle lock around her neck - a common direct action tactic. On February 27, 2007, 15 Rising Tide Australia activists blockaded the headquarters of the New South Wales Labor Party, in a protest of the provincial government's proposed plans to expand the Newcastle coal port. Activists blocked the door with several 44-gallon drums, and one woman chained herself to one of the blockades. The protestors demanded that the provincial government announce whether or not the port would be expanded. Two people were arrested. On June 8, 2007, Australian Student Environment Network activists blockaded the office of the New South Wales Department of Planning. The protestors criticized the Department's June 7 decision to allow the Anvil Hill coal mine to fully drain the Hunter River, in order to supply its mine with water. One person, dressed as a polar bear, chained herself to the doors of the building. On July 3, 2007, Greenpeace Australia activists dumped four tons of coal in front of the door of the New South Wales Department of Planning, blocking the entrance to the building. The protestors criticized the Department's June 7 decision to allow the Anvil Hill coal mine to fully drain the Hunter River, in order to supply its mine with water. The sign outside the office was changed to read "Department of Coal Approvals." No arrests were reported. 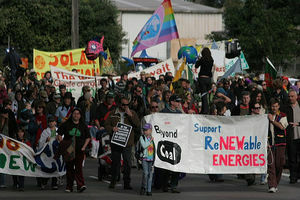 On September 3, 2007, activists from Real Action on Climate Change occupied the coal-fired Loy Yang Power Station in Traralgon, Australia. Two people chained themselves to the coal conveyor belt, and others hung several large banners from the plant. The action took place several days before an Asia-Pacific Economic Cooperation summit in Sydney, and was intended to draw attention to Prime Minister John Howard's failure to limit Australian carbon emissions. Four people were arrested. 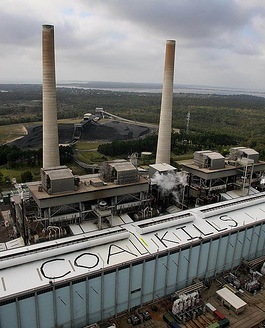 Greenpeace activists paint "Coal Kills" on the roof of the occupied Munmorah Power Plant near Wyong, Australia, on Nov. 15, 2007. On November 15, 2007, 15 Greenpeace Australia activists occupied the Munmorah coal-fired power plant near Wyong, Australia. Two teams of five people - including engineers - switched off the conveyor belt that brings coal into the plant, and then chained themselves to the machinery. Another team painted "Coal Kills" on the roof of the plant, and hung a large banner inside. The action took place several days before Australian parliamentary elections, and was held in protest of the climate change policies of both major Australian political parties. All fifteen people were arrested by police. Protesters rallied outside while two campaigners infiltrated a major coal conference in Brisbane, Australia, calling for more Queensland Government support for renewable energy. Once inside, the the two activists took the floor and addressed the Queensland Coal08 conference, which was held to discuss the future of the coal mining industry in the largest coal exporting state in the largest coal exporting country in the world. No arrests were made. On July 3, 2008, Greenpeace activists shut down a portion of the Eraring Power Station by chaining themselves to a coal conveyor. Eraring Power Station, near Sidney, Australia, releases nearly 20 million tonnes of greenhouse pollution into the atmosphere every year. At dawn on July 3, 2008, 27 Greenpeace activists entered the 2,640 megawatts Eraring Power Station site north of Sydney to call for an energy revolution take direct action to stop coal from being burnt. Twelve protesters shut down and chained themselves to conveyors while others climbed onto the roof to paint 'Revolution' and unfurled a banner reading 'Energy Revolution - Renewables Not Coal'. The action preceeded the Australian government's climate change advisor Professor Ross Garnaut's delivery of his Draft Climate Change Review on July 4. Police arrested 27. On July 11, 2008, four Greenpeace activists climbed the 462 foot high smokestack of the coal-fired Swanbank B power station near Brisbane, in Queensland, Australia. While the smokestack climbers hung a 'Renewables Not Coal' banner, two other activists climbed onto the roof of the plant and unfurled a banner reading 'Energy [R]evolution'. The four remained on the smokestack overnight in near freezing temperatures. On July 12, one of the protesters painted 'Go Solar' in huge lettering down the side of the smokestack. After 33 hours of occupation, all four climbers descended voluntarily. The goal of the action was to raise the level of debate in Queensland and the rest of Australia, re-emphasize the urgency of the climate change issue and the need to start shifting from coal to renewables. On July 13, 2008 approximately 1000 activist stopped three trains bound for export at the Carrington Coal Terminal for almost six hours. Dozens of protesters were able to board and chain themselves to the trains while others lay across the tracks. Hundreds were held back by mounted police. Police arrested 57. On July 14, 2008, five activists stopped coal loading at the Kooragang coal export terminal for more than two hours by chaining themselves to a conveyor belt. Later that afternoon four protesters padlocked themselves to the tracks at the Carrington terminal, stopping all train traffic until police were able cut the group free. All nine were arrested. On July 21, 2008, nearly 200 concerned residents and landowners in northern New South Wales blockaded a farmer's driveway to prevent a BHP-Billiton drilling rig onto the property to explore for coal deposits. Local residents are asking for an independent study into the effects the exploration and coal mining will have on local underground water reserves. A court had previously issued an injunction against the landowner when he drove a grader across his driveway to prevent the exploratory team from entering his property. Using inflatable rafts, nine Greenpeace activists painted anti-coal messages on 20 coal ships waiting to enter the world largest coal export port in Queensland, Australia. The action intended to highlight the contradiction between the Australian prime minister's stated intention of urgently reducing greenhouse pollution while doubling Australia's coal exports. All nine activists were arrested. On November 1, 2008, a large group of people from Rising Tide Newcastle walked onto the site of Bayswater Power Station, New South Wales (the equal biggest source of greenhouse gas pollution in Australia). Four people locked onto both conveyors, shutting down coal input into the station for six hours. 25 further people walked onto the coal piles outside the power station, disrupting operations by their peaceful presence, and were arrested for trespass. The group called on the government to begin phasing out coal as quickly as possible, peaking carbon emissions by 2010 and taking the strongest possible position to the UN COP negotiations in Posznan and Copenhagen. Pictures have been posted on the Rising Tide website. On November 5, 2008, two activists stopped and chained themselves onto a conveyor belt at Collie Power Station, which produces 300MW of Western Australia's electricity and consumes around a million tonnes of of coal per year. Lee Bell, a spokesperson for the group, not affiliated to any organisation, said that the protest was part of nationwide action against the Government's inaction on climate change and the failure to phase out coal-fired power. Twelve people gathered in the car park outside the power station. On November 6, 2008, a group of activists walked onto the site of the Hazelwood power station, one of the most inefficient power stations in the industrialised world, to protest Australian inaction on climate change. Two people stopped and chained themselves to the conveyor belts which carry coal to the power station. The station was due to be decommissioned in 2009 but is undergoing rapid expansion to 2009.. The group posted an explanation of their action, information about the plant, and justification for direct action on a purpose-built blog. On November 7, 2008, two activists locked onto a conveyor belt and forced the evacuation of Queensland's Tarong Power Station, which produces around 1400MW of the State's energy. Station operator Tarong Power produces up to 25 percent of Queensland's electricity from three coal fired power stations, uses up to 7 million tons a coal a year from the company's nearby coal mine. This action was the fourth action in just seven days targeting the coal industry in Australia and calling for the phase out of coal-fired power. The action also served to highlight the risk to Queensland's world heritage icon, the Great Barrier Reef, posed by climate change. Three people were arrested . 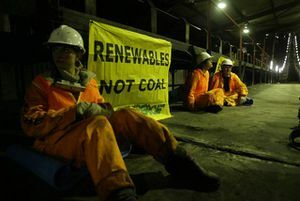 Hundreds of activists shut down the world's largest coal terminal to send a message to Australia to stop exporting coal. The blockade prevented coal carriers from entering Newcastle. The protesters paddled kayaks and boats made from milk crates and inflated inner tubes. Greens parliamentarian Lee Rhiannon commented, "These people sent a serious message that the government, if they are going to be serious about climate change, they must address the coal industry." He also promised that, "we will continue with future peaceful actions if we think it's necessary." Greenpeace activists used the group's largest ship to block BHP Billiton's coal terminal on the northwest coast of Australia. The action halted loading and shipments for the world’s largest mining company for more than 36 hours. Four protesters from Climate Camp locked themselves to a conveyor belt at a the Dendrobrium coal mine south of Sydney. Police arrested five people, who will likely be charged with trespassing. Approximately 25 activists from Rising Tide Australia chained themselves to railroad tracks and a coal train to stop stopped trains from entering the Kooragang coal export terminal. The protest was aimed at shutting down coal export operations at Newcastle, which is the largest coal port in the world. The standoff continued for 6 hours before the protesters were removed by police. 23 activists were arrested and charged with rail safety offences. A flotilla of 60 rafts, kayaks and a yacht try to blockade coal ship movement into the port of Newcastle. Newcastle is the port through which the rapidly expanding coal mines in the Hunter Valley are being exported. "We're not willing to accept the massive expansion of the coal industry in New South Wales and coal is Australia's major contributor to climate change and it's also the fastest growing," said Rising Tide spokesperson, Naomi Hodgson. On May 19, 2010, 54 cotton and grain harvesters and tractors formed a kilometer-long blockade in Queensland, Australia, to protest the expansion of the coal seam gas mining industry on the Darling Downs. The blockade was accompanied by a rally of 500 farmers and other concerned citizens, organized by Save Our Darling Downs. Speakers expressed concern that extraction of methane gas from coal seams would require use of large quantities of underground water from the Great Artesian Basin, thereby undermining local agriculture and threatening farming communities such as Cecil Plains. Climate change activists in Australia associated with Rising Tide attached themselves to equipment inside the world's largest coal port, in Newcastle, Australia, shutting down its operations, the terminal operator and protesters stated. The protestors stopped operations at all three terminals operated by Port Waratah Coal Services, which typically runs a continuous operation, a company spokesman told the Reuters news agency. "All operations have temporarily stopped," the spokesman said, after about 50 protesters took action at dawn on Sunday morning. Some attached themselves to loaders and machinery inside the facility, while others demonstrated with banners. News reports stated that two were arrested during the protests. 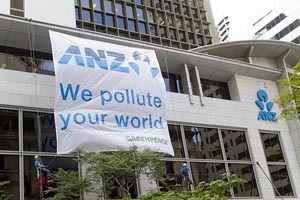 At least 33 protests have been held in NSW, Queensland, South Australia and Victoria, with demonstrators giving out flyers and holding placards as well as hanging banners outside ANZ bank headquarters, and projecting the same message on a power station: ANZ We Pollute Your World. On 19 October 2010 Greenpeace displayed a projection on the side of Yallourn W power station, in Moe, Victoria, as part of the campaign targeting the financing of Australia's coal industry. Greenpeace referred to the power station as "the third most polluting power station in Australia and one of ten across the country financed by ANZ over the last five years." 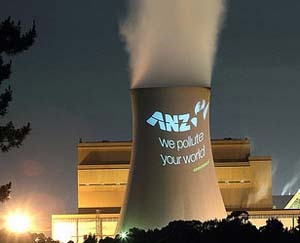 On 21 October 2010 Greenpeace hung a banner on the side of the ANZ state headquarters in Brisbane, Queensland to highlight the the fact that ANZ has provided $1.6 billion in finance to the coal industry over the past five years while claiming to be a leader in sustainability. "ANZ have been winning awards for sustainability amd has a commitment for going carbon-neutral, but at the same time, they're the bigget financiers of polluting coal in Australia. We think that is hypocritical. They should put their money where their mouth is," said Greenpeace spokesman John Hepburn said. Four Greenpeace activists associated with the protest were arrested. Activists with the Western Downs Alliance and the Friends of the Earth protested against coal mining, underground gasification, and coal seam gas operations by QGC. The actions were intended to kick off the organizations' "Lock the Gate" campaign. Members of Western Downs Alliance, which represents landowners living near Tara, blockaded the Condamine Highway before marching on QGC’s Kenya gas field south of Chinchilla. In Brisbane, about 40 protestors led by Friends of Earth spokesman Drew Hutton picketed outside QGC’s headquarters. ↑ Two Arrests in Coal Protest, Fox News, February 27, 2007. ↑ ALP HQ Blockade: Decision on Newcastle Coal Export Terminal Needed, Rising Tide Australia website, accessed January 2008. ↑ Polar Bear Locks On at Department of Planning Against Anvil Hill Mine, Australian Student Environment Network website, June 8, 2007. ↑ Greenpeace Dawn Blockade: Climate Protestors Call for ‘No New Coal’ as NSW Water Crisis Worsens, Greenpeace Australia press release, July 3, 2007. ↑ Chain Reaction: 15 Protestors Arrested, Sydney Morning Herald, November 15, 2007. ↑ Protesters picket Qld coal conference, Australian Broadcasting Corporation, June 16, 2008. ↑ Activists protest at Australian power plant, Reuters UK, July 3, 2008. ↑ Greenpeace protesters scale 140m chimney, Sydney Morning Herald, July 11, 2008. ↑ "It’s a wrap: watch a video of the occupation as it unfolded", Greenpeace Australia website, accessed July 15, 2008. ↑ PM's Brisbane office targeted by green protesters, Brisbane Times, September 22, 2008. ↑ "Friends of Felton occupy Anna Bligh's office", Friends of Felton website, accessed November 12, 2008. ↑ "Protesters close Newcastle coal terminal," Steel Guru, March 23, 2009. ↑ "BHP Coal Berth Blocked by Greenpeace Ship as Protest Continues," Bloomberg, August 6, 2009. ↑ "Activists chained to coal mine conveyor belt," The Australian, October 11, 2009. ↑ "Activists charged over coal protest," Australian Associated Press, December 20, 2009. 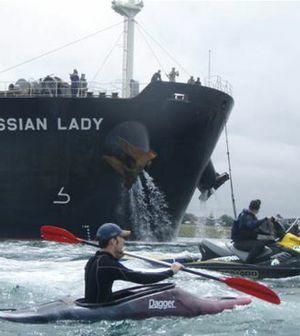 ↑ "Protesters trying to block Newcastle's coal port", ABC News, March 28, 2010. ↑ "Protests close Australia coal port" Ajazeera, September 26, 2010. ↑ "Pair arrested over coal port protests" Dan Cox, September 26, 2010. ↑ Greenpeace Australia, "October 2010", Greenpeace Australia website, October 2010. ↑ Greenpeace Australia, "Greenpeace takes action against ANZ - Australia's dirtiest bank", Greenpeace Australia, accessed April 2011. ↑ "Greenpeace protesters arrested after scaling ANZ building in Brisbane and unfurling banner", Courier Mail, October 21, 2010. This page was last edited on 24 October 2012, at 04:19.